Hey Mike – didn’t you have something to do with making this happen? If so, thanks! And thanks for latest round of scholarships from your foundation. My nephew was awarded $8,200, and he is stoked! He’s gonna repair bulldozers! Two years ago, I made a short video that criticized national publications for ranking America’s Top 4-Year Colleges and Universities while completely ignoring two-year trade schools. It really is an outrageous oversight that reinforces the stubborn belief that some forms of education are more important others. 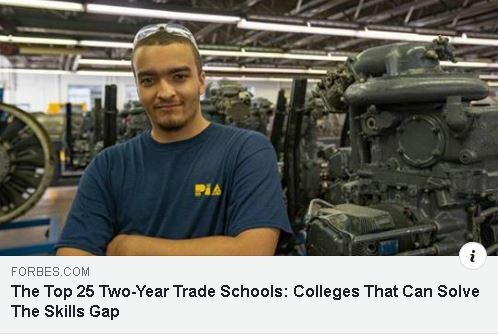 To their credit, Forbes Magazine acknowledged the bias, and dedicated a whole issue to ranking the best trade schools in the country. This is their second annual issue, and my second opportunity to congratulate them for doing what their competitors have not. Nice job, Forbes.